U.S. Buildings believes you should be able to protect your commodities for an affordable price, and that’s why we offer customizable steel building solutions with a 35 year limited warranty to fit your unique storage needs. Our buildings are perfect for new commodity storage or for replacing an existing pole barn or wooden frame pole building that’s been warped or rotted. We can help you protect your valuable commodities from snow, frost and other elements with our fully customizable metal and steel buildings. We guarantee, U.S. Buildings products will outlast and outperform your old conventional pole barn construction for years to come. By using one of our steel metal buildings, you can save up to 60% off what a brick, block or wood building would cost. You’ve worked hard for your machinery, equipment, hay, grain and livestock and you can easily own a sturdy, dependable structure for storing your valuable commodities. Call U.S. Buildings now to speak with one our factory consultants and let us help you determine the building that will suite your needs best. 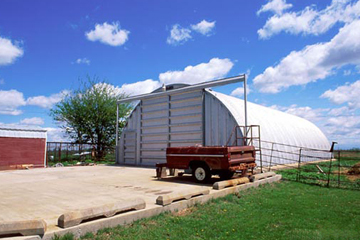 U.S. Buildings is America’s number one choice for farm buildings and we think you’ll soon agree. Why Do People Choose U.S Buildings steel buildings? Call U.S. Buildings now toll-free at 800-222-6335 to speak with one of our steel building specialists. Be sure to ask about our factory direct building specials that could save you up to 60% off your steel structure. Just give us the dimensions of your building projects and we’ll provide you with great options, a competitive price and a building that you’ll be proud to show off. Call us now!